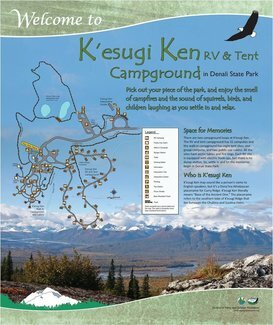 Join your fellow Guild members for a textile camping trip to K'esugi Ken campground (mile 135.4 of the Parks Hwy), July 25 to July 28. Come for as many nights as you choose, bring your textile projects and your hiking shoes. A covered pavilion (interpretive center on map) is available in case of rain (or shine). Check out the website at: http://dnr.alaska.gov/parks/sdenali/index.htm. This takes you to Denali State Park reservations. Narrow your search by selecting the loop: K'esugi Ken Campground. Remaining campsites are 1st come, 1st served. In total there are 8 "walk in" tent sites for $20/night. The remaining 32 sites have electric with paved RV pads and tent pads are $30/night. There is an RV overflow area is very close to the pavilion where we plan to gather. Saturday night potluck is Italian themed. Bring something to share. When you decide what you are bringing, add it to the comments section. We have the sign up to help coordinate who is coming and where people are staying. It is pretty easy to share sites. The walk in sites can hold 2 tents. The remaining sites can easily hold an RV and a tent. Some can hold 2 RVs. So sharing a site is a very real possibility. You do not need to sign up to attend.